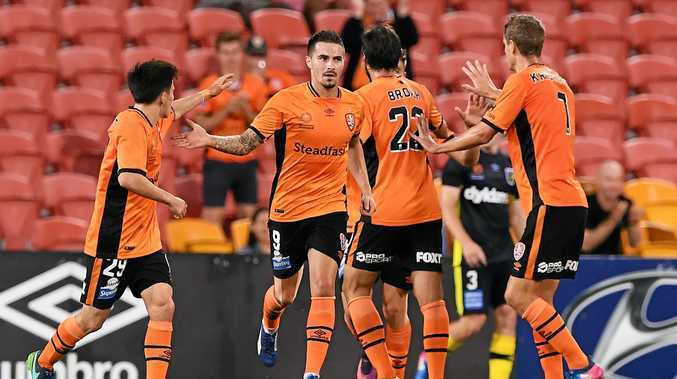 JAMIE Maclaren's rich vein of goal-scoring form continued at Suncorp Stadium last night, with the Socceroos discard netting a hat-trick in Brisbane Roar's 5-1 thrashing of A-League cellar dwellers Central Coast Mariners. Dumped by national coach Ange Postecoglou for Australia's recent internationals against Iraq and United Arab Emirates, Maclaren is responding by spearheading the Roar's championship push. Maclaren has now scored 10 goals in his past seven A-League matches, with his three against the Mariners lifting the Roar into third spot on the ladder, three points clear of Melbourne City. And in terms of individual honours, Maclaren who remains at long odds to be with the Roar next season after rejecting Brisbane's offer to re-sign him has zoomed into Golden Boot contention. With two rounds of the regular season remaining, the former Perth Glory marksman has drawn level with Melbourne Victory's ex-Brisbane striker Besart Berisha at the top of the goal-scoring charts with 18. "Tonight he showed again that he's a goalscorer," Roar coach John Aloisi said. "He had a bit of a quiet spell during the (season), a lot of speculation on whether he's staying or going and it was good for him because that's how you end up maturing as a player, and he's done that, he's blocked that all out and he's just focused on doing well for Brisbane Roar. "If he does stay in the A-League, we'd love to keep him, if he goes overseas I understand." Maclaren refused a request to speak at the post-match press conference but in a television interview said that despite his three goals, he felt he wasn't at his best. "I didn't play well tonight but I scored a hat-trick," he told Fox Sports. "(But) if I went and asked the boss (Aloisi) what would you rather playing well or scoring goals I know what his answer would be." Maclaren netted his hat-trick in the space of eight second half minutes, scoring in the 62nd, 66th and 70th minutes, as the Roar fought back from a goal down to swamp the visitors. Veteran marquee man Thomas Broich, who was sublime, and substitute Nick D'Agostino added the icing on the cake with goals in the final 10 minutes. The visitors had grabbed a shock lead four minutes after the half-time break via Fabio Ferreira. It could easily have been 2-0 to Mariners two minutes later but Roy O'Donovan's sizzling strike hit the post. The Roar made the most of their reprieve, much to the despair of Central Coast and their coach Paul Okon. "We knew the Roar would come at us in the second half ... they got a little bit angry and upset and put the accelerator down and just over-ran us," Okon said. "No complaints about the result."